Bleeding Heart by Liza Gyllenhaal Giveaway! After her accountant husband disappears with millions of dollars stolen from his company’s clients, Alice Hyatt flees New York City and moves to her family’s longtime summer home in a small town in western Massachusetts. There she begins to make a new start, reconnecting with old friends and finding peace—and a growing sense of pride—as a landscape architect. 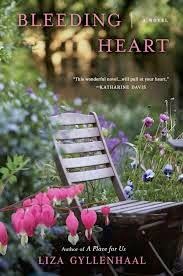 When extremely wealthy newcomer Graham Mackenzie asks her to design an elaborate garden for him, she can’t turn down the opportunity despite misgivings about Mackenzie’s energy company, which specializes in the controversial practice of fracking. Courtesy of the publisher, I have one copy of this book to give away to a US resident. Just fill in the form below to be entered!